The macabre approach isn't so surprising though considering Hirst was inspired by David Cronenberg's film Dead Ringers. The assignment was to design a piece to reflect Hirst's art, rather than the luxury of Louis Vuitton, so I suppose this creepy creation fits the bill! 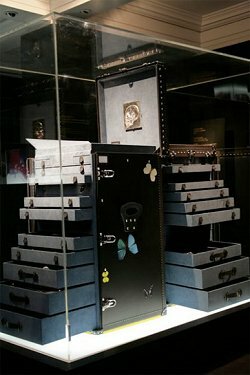 Hirst oversaw the development of his trunks in Louis Vuitton's Asnieres workshops. Each is made from black nomade leather covered in blue microfiber fabric. The interiors are decorated with an odd combination of butterflies and silvery skulls. No prices or launch dates have been announced as yet, although we can apparently expect a global release. For now though, we'll just have to be content looking at the photos!